Date: 5.04.2018 | Dance, Disco, Pop | Tags: Italo Disco, SpaceSynth Collection, Zyx Music, ZYX, Spacequake, Mike Cannon, Spanish Symphonic Orchestra, City Center, Italove | Download ZYX Italo Disco SpaceSynth Collection 4 (2018) for free. 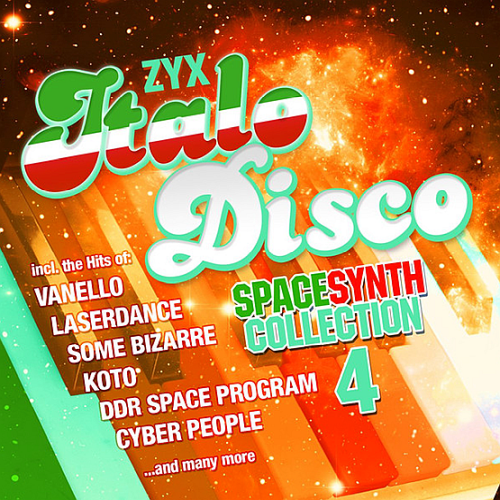 Again ZYX Italo Disco Spacesynth Collection reflect the winning formula of this compilation series. CD1 entirely consists of newly produced titles in the style of 80s Spacesynth classics. Laserdance Some Bizarre, Italove and many more revive the tradition of great synth melodies. Us usual CD2 features great heroes of the 80s Spacesynth Sound: Koto, Hypnosis, Mind Control. Generally, Italo-Disco consists of English pop vocals often sung a little weirdly by non-native English speakers over mid-tempo, heavily synthetic disco or hybrid disco-electro rhythms, with emphasized lead synths. It was mostly produced by Italians. This style scene is said to have been named by ZYX Records to market licensed releases and numerous compilations, although not always strictly Italian productions.